Some Area Info: Richford is a town that shares its northern border with Canada and is located in the northwest corner of Franklin County. 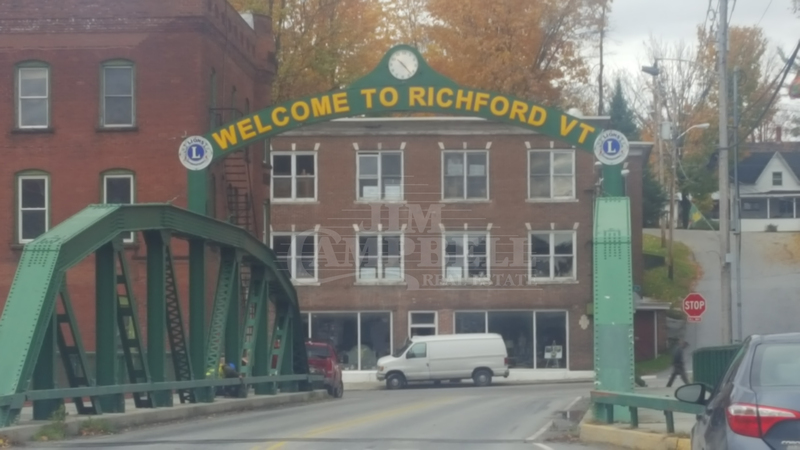 Richford has a population of approximately 2308 and is 43.3 sq. miles. Several of the buildings in Richford are listed on the National Register of Historic Places, including the Richford Primary School and St. Ann’s Episcopal Church. The town was chartered in 1780 and the first settlers arrived in 1795. In the mid 1800’s Richford became a hub for trade and commerce and had two railroad lines. Attractions and Recreation: Richford has a 26 mile Missiquoi Rail Trail used for snowmobiling, biking and hiking and has one of the most scenic golf courses. Astonishing views from this country home with a massive open living area. The house has radiant heat and offers one level living. This home has an open kitchen living area with cathedral ceilings. The in ground pool has breathtaking mountain views and pure privacy. The property has a 2 car garage/barn and an outdoor wood boiler. Property is part of a larger lot and needs to be subdivided to 10 acres + or - expect an extended closing. 15 Minutes to Jay Peak and 1 hour 15 min to Montreal. Located within 5 miles of the Canadian border, you can enjoy every season in this updated home. Close to Sutton, Quebec and Jay Peak Resort, this 3 bedroom, 2 bath home features an inviting in-ground pool located on a dead end road. As you enter the home through the mud room, the custom trim work stands out throughout. A large dining room has a soapstone wood stove to keep all your gatherings warm and cozy in the winter. Sliders to the deck access the yard and pool for summer enjoyment. The kitchen is stunning, with cherry cabinets and Corian counter tops. First floor bedroom with large bath features a Jacuzzi tub, double sinks and cherry cabinets. Laundry room on the first floor. The over-sized second floor master bedroom boasts a propane fireplace. There is a full unfinished basement and a 2 car attached garage. Rolling and open yard. Come enjoy all this home has to offer. What a value in this hill section home. This house has a mix of vintage charm and modern conveniences. The home has a powerful kitchen with a 10x5 walk-in pantry and quality appliances in addition to a breakfast nook. The formal dining room is 17x13 and has hardwood throughout the first floor. There are two connected living spaces and one has a gas stove in the fireplace. When you enter through the front door you are greeted with a powerful staircase that was a centerpiece of the home. There are several stain glassed windows throughout the house and a partially finished attic space that could add additional finished square footage for a the new owners. The house has 5 bedrooms and 2.5 baths. Outside you benefit from a large private yard with classy landscaping and a 38x24 combination garage / barn with overhead storage. New Hot Water Heater. Come take a look and see the true pride in ownership this house exudes. This double wide is just like new. Everything has been done inside and out. You have new windows and doors, metal roof, vinyl siding, back deck and covered front porch. Inside is all new sheet rocked walls, floors (carpeting, laminate & vinyl), recessed lighting, hardwood kitchen cabinets and brand new appliances. This home offers three bedrooms and two baths and is in turn key condition.